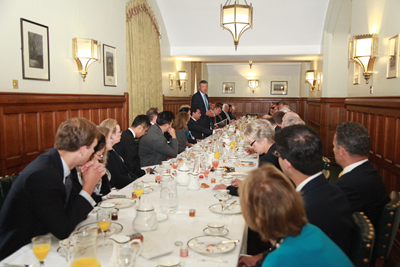 It gives me real delight to join you for the Conservative Parliamentary China Group's Breakfast Meeting for the fourth time. Chairman Clifton-Brown asked me to talk about the opportunities for China-UK cooperation on trade and investment against the background of Brexit. 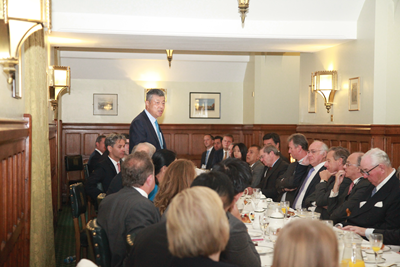 It's been seven years since I attended the first breakfast meeting of the Conservative China Group. In the past seven years, I visited many places around Britain, from England to Scotland, from Wales to Northern Ireland, and from the Crown Dependency the Isle of Man to the Overseas Territory of Bermuda. Wherever I went, I always met with people from different sectors. Almost all of them have high hopes for cooperation with China and strong desire to see it grow. I believe that is the fundamental vitality that keeps China-UK relations moving forward. Through my visits I also came to see that business cooperation between China and Britain plays such a crucial role. It is the "stabilizer" and "propellant" of our bilateral ties. This is because our business cooperation brings tangible benefits, demonstrates a pioneering spirit and reaches to broad social sectors. First, China-UK business cooperation brings tangible benefits to both our countries. China and Britain are important trade partners for each other. In 2016, China was Britain's third biggest trading partner, third largest source of import and seventh largest market for British goods. Last year, bilateral trade in goods totalled at 74.34 billion US dollars, making Britain China's second largest trading partner in the EU. From January to July this year, trade in goods reached 44.34 billion US dollars, up by 7.1%. China's export to Britain was 31.66 billion, up by 3.5% while China's import from Britain was 12.68 billion, up by 17.1%. Mutual investment is also growing fast over the years. Britain is China's second biggest investor in the EU. China has 18 billion US dollars non-financial investment in Britain, more than in any other EU countries. More than 500 Chinese companies have settled down in Britain. Their investments are going to areas beyond conventional sectors such as trade, finance and telecommunication. They are reaching out to emerging industries such as new energy, high-end manufacturing, infrastructure, R&D centre, etc. Cayman Islands and British Virgin Islands are now the largest and second largest destination only after Hong Kong for director investment from China's mainland. Undoubtedly, in the context of sluggish global economic recovery and rising protectionism, what China and Britain have achieved in our business and investment cooperation is extraordinary. Second, China-UK business cooperation has always demonstrated a pioneering spirit. Our two countries have always been daring to take the lead in establishing new models of business cooperation, in expanding it to new fields, and in creating new highlights. Britain was the first major Western power to apply to join the Asian Infrastructure Investment Bank, and the second only after China to contribute capital to the AIIB's special fund. Britain was the first in the world to issue RMB sovereign bonds and London is now the largest RMB offshore market outside China. On our side, China issued its first overseas RMB sovereign bonds in London. The Bank of China issued in London a three billion dollar green bond, breaking new ground for China-UK cooperation on green finance. The CGN is the first Chinese nuclear company participating in Britain's nuclear project. The Hinkley Point C nuclear plant has become a flagship project of the China-UK "Golden Era". China's Nanjing Automotive Corporation and the Geely Group bought British automakers. Their acquisitions have resulted in a perfect match between British design and Chinese manufacturing capabilities. Early this year, a freight train of China Railway Express arrived in London before making a round trip back to China's Yiwu. It marks the extension of the new Silk Road to the very western end of Europe. The list can go on and on. These examples are all vivid reflections of the pioneering spirit in our creative cooperation. Third, China-UK business cooperation reaches broad social sectors. China and Britain have shared commitment to economic globalization, trade liberalization and investment facilitation. Our interests converge and our communication and cooperation have been effective in facilitating free trade, improving global economic governance and reforming the international financial system. In 2016, China successfully hosted the G20 Summit in Hangzhou. China and Britain co-chaired the G20 Anti-corruption Working Group and made the action plan for combating cross-border corruption. The G20 Green Finance Study Group, co-chaired by the central banks of our two countries, led to the global consensus on green finance. Our role in building a robust, sustainable, balanced and inclusive world economic growth has been strong and active. In this sense, China-UK business cooperation has an impact that reaches far beyond the bilateral scope. The solid basis for China-UK business cooperation remains unchanged. The momentum of China-UK business cooperation remains unchanged. And the promising prospects for China-UK business cooperation remain unchanged. As the situation unfolds, China-UK business cooperation faces three new opportunities. The first is the strategic opportunity of China-UK "Golden Era". President Xi Jinping's successful state visit to the UK heralded our global comprehensive strategic partnership for the 21st century. It marked the beginning of a "Golden Era" for our bilateral ties. During the G20 Hangzhou Summit last year and the Hamburg Summit not long ago, President Xi and Prime Minister May reaffirmed the shared commitment to the "Golden Era" in their bilateral meetings. The frequent high level interactions and strengthening political mutual trust means there is strong political guidance for our relationship. And this will open a "window of golden opportunity" for the business cooperation between our two countries. Second, China and Britain can create the opportunity for common success if we match up our respective strengths. China and Britain have respective advantages in development model, industrial structure and international division of labour, R&D and innovation, etc. We are at different stages of industrial adjustment and transition. Therefore there is much we can offer each other. In many areas the interests of our two countries converge and in more fields there is huge untapped potential for further cooperation. China is good at equipment building and has abundant financial resources. Britain is strong in innovation, R&D, high-end manufacturing and financial services. If we can work together and pool these strengths, we will achieve common success. Moreover, Chinese businesses are enthusiastic about investing in Britain's infrastructure, branding, energy conservation and many other fields. Britain's commitment to free trade, your rule-based market, your sound legal system and your openness to Chinese investment, will all work in Britain's favour. The third opportunity comes from China-UK cooperation on the Belt and Road. As a new area of China-UK cooperation, the Belt and Road has huge business opportunities. Greater potentials remain to be tapped. From the government to business community, from financial sector to academia, the rising enthusiasm for Belt and Road cooperation can be felt in this country. People from different industries are coming forward with their advice and suggestions. In May, Chancellor Hammond attended the Belt and Road Forum for International Cooperation in Beijing as Prime Minister May's personal envoy. His participation brought new dynamics to China-UK Belt and Road cooperation. CBBC and HSBC issued their Belt and Road reports, providing guidelines for British companies who are interested in the Belt and Road Initiative. China regards Britain as a key partner in building the Belt and Road. Britain has rich experience in financial and legal services, project management and risk control. Our two countries can work to dovetail our development strategies and strengthen policy coordination within the framework of the Belt and Road. We could also engage in tripartite cooperation with countries along the Belt and Road. Such cooperation could become a new highlight. Thanks to our concerted efforts, China-UK business cooperation has produced fruitful results over the years. We can all look to an even brighter future. However, given the rising anti-globalization and protectionism, we must stay true to our commitment, work together to remove obstacles and focus on the way ahead. We should devote our efforts to making sure that our cooperation enjoys healthy and sound environments, which I have summarized as "four environments", namely, the political environment, the policy environment, the public opinion environment and the international environment. Sound political environment is the precondition for growing state-to-state ties. It is fundamentally important to advancing trade and investment cooperation. In state-to-state relations, China has always valued the ideas of "peace being of paramount importance" and "harmony without uniformity". Countries may differ in social system and ideology. But in dealing with each other, we should focus on what we have in common and seek shared interests. China believes countries should learn from each other through exchanges and communication, build common grounds and engage in win-win cooperation. As President Xi rightly put it, "Those who share the same ideal and follow the same path can be partners. Those who seek common ground while shelving differences can also be partners." China and Britain should always view each other as equal partners and treat each other with respect. We should enhance mutual understanding on the basis of tolerance. We should build up mutual trust with an open mind. We should forge friendship as we deal with each other. We should, at any time, approach our bilateral ties from a long-term strategic perspective. This requires us to always respect each other's core interests and major concerns. This also calls on both sides to deal with differences and sensitive issues in a constructive way. Above all, China and Britain should build a sound political environment which will enable the "Golden Era" to endure. Prime Minister May reiterated the UK's commitment to building a truly "Global Britain". This means the UK will continue to support free trade, oppose protectionism, and actively develop and reinforce business ties with global partners. We look forward to a Britain that continues to be open. UK's commitment to staying open will send out a positive signal and help build up world confidence in Britain's future. It is our hope that Britain will continue to be non-discriminative and transparent in its policy-making with regard to foreign investment. Policy-makers should take into account the legitimate rights and interests of all investors including the Chinese businesses. I hope that the policy environment in Britain will continue to be open, fair and predictable. I noted that the British media focuses considerable attention on China's development. But some of their reports on China are based on misunderstanding and prejudice. Take for example the alleged "threat of Chinese investment". The so-called China's appetite to buy out Britain is pure fabrication. As for the claim that Chinese investment poses danger to UK's national security, such demonization is groundless and harmful not only to Chinese companies but also to the UK. Last month I wrote an article on this topic for the Evening Standards. I hope my article will help you see that Chinese investment in Britain is not China's gain at the cost of Britain. It is not a China-win-Britain-lose scenario. Rather, Chinese investment in the UK is mutually beneficial. I would like to highlight that, Chinese companies are here for cooperation and win-win results. They expect a friendly and welcoming environment for foreign businesses not only in policies and rules, but also in public opinions. I hope they will find what they are looking for here in Britain. I hope their decision to put their money here will prove to be a right one. At present, the world economy is showing some positive momentum. But on the whole, global economic and financial uncertainties and instabilities are still on the rise. Some deep-rooted problems remain unresolved. "We must remain committed to developing global free trade and investment, promote trade and investment liberalization and facilitation through opening-up and say no to protectionism." China always stands ready to strengthen collaboration with the UK in the field of international governance. Our two countries must work together to uphold economic globalization, trade liberalization and investment facilitation. We must join hands to lead the international community in a joint response to challenges. This is what our two countries can do to contribute our part to building a global economy that is innovative, invigorated, interconnected and inclusive. "A single twig is easy to snap but a bunch of twigs is too strong to break." In face of the complicated, profound adjustment of international landscape and the daunting global challenges, China and Britain have every reason to enhance coordination and address challenges hand in hand. 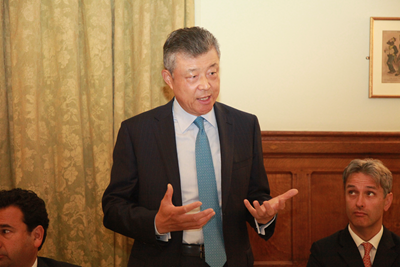 The Conservative Parliamentary China Group has long been engaged in strengthening China-UK exchanges and cooperation. You have made active efforts in facilitating parliamentary communications and business cooperation between our two countries. This year marks the 45th anniversary of China-UK Ambassadorial diplomatic relations. It is also a year for consolidating the China-UK "Golden Era". I hope in this "Golden Era", the Conservative China Group will continue to play a constructive role. I hope China and Britain will continue to stay open and embrace the principles of openness, inclusiveness and win-win cooperation. I hope we will work together to seize the three opportunities and ensure four sound environments as I elaborated a moment ago. And I am confident that our shared commitment and joint efforts will enable China-UK business cooperation to bear more "golden fruits" and deliver more benefits to the people of our two countries and beyond.